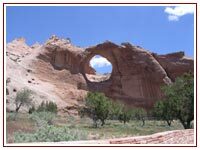 The Navajo Nation is the largest U.S. Indian reservation, spreading over 16 million acres of high desert in Arizona, New Mexico and Southern Utah. Many of the 255,000 Diné, as the Navajo call themselves, live in communities so remote that they are accessible only by four-wheel-drive vehicles. Most of these communities offer few employment opportunities. Many families struggle to survive in the face of extreme poverty, substandard housing, sporadic medical care, and limited educational opportunities. You may wonder why tribal members don’t just move to more populated areas, and many do just that. But others will tell you that they could not bear to leave the land their ancestors have inhabited for centuries, their traditional language and ceremonies, and their extended families. 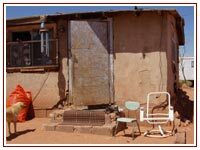 The Navajo Relief Fund (NRF) brings hope to these struggling people. Even more importantly, NRF helps build “strong, self-sufficient Native American communities” by drawing on the deep commitment to clan and culture that is prevalent on many reservations. housing with little access to resources.